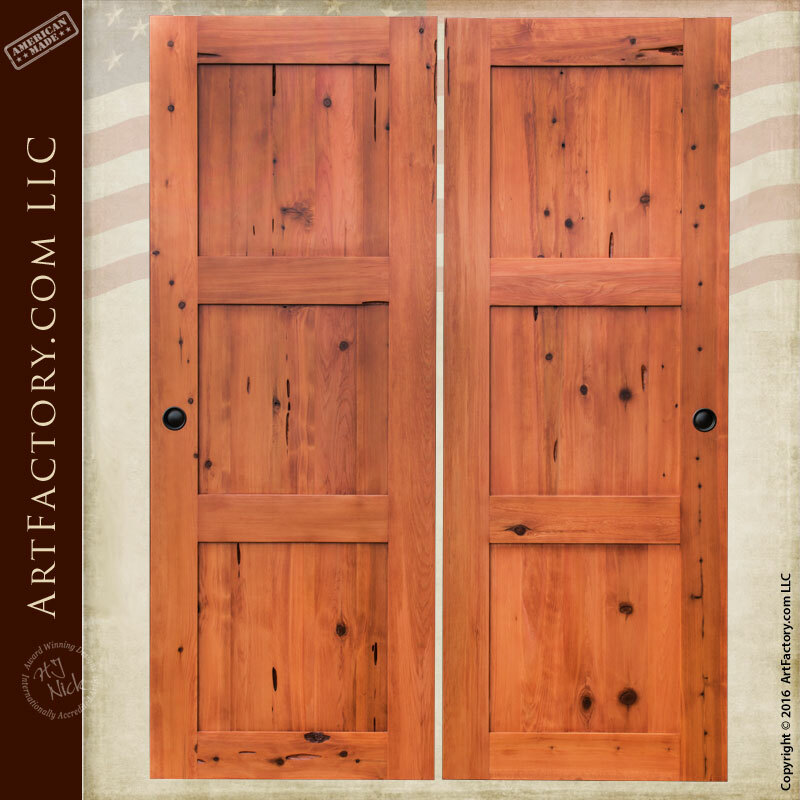 Custom Solid Wood Sliding Doors – Rustic Style Double Doors – Owning doors that are solid wood means owning something you will cherish for generations. Each custom wood door is 3″ thick, built to withstand any weather, and hand crafted from wood we source on our own lots. So when you need an all-natural solid wood interior door, we have the perfect rustic or cabin look you’re after. All of our custom wood double doors come with the ultimate promise – guaranteed forever. These three panel cedar double doors capture the beauty of simple design. Our dedication to old world design and techniques means your door is a piece you can feel proud to own. Our master woodworkers hand cut, hand sand, and hand finished each and every solid wood door to bring elegance to your home that is beyond compare. Order your custom wood sliding doors made from any type of wood, in any size and style to fit your home, castle, lodge, or business. Our door hardware is available in a variety of styles and finishes and always hand built to your specifications by our master blacksmiths. Also using tried and tested methods, centuries old. Hand forged wrought iron, anvil hammered and patina finished therefore ensures that your custom door pull will never erode.